The story of less polluting materials. Any product can be replaced by alternatives. But if they are less polluting, that is another question. In the following page, some complete Life Cycle Analyses, which were made by governments or companies not involved in the chlorine/PVC discussion, are shown. They all give as result that PVC is one of the least polluting materials, comparable with other plastics and far better than a lot of traditional materials. 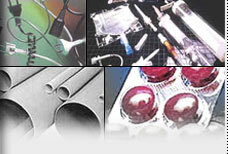 material producers (paper, glass, aluminium and plastics). manufacturers of finished products (food industry and pharmaceuticals). environmental interests (Naturvernforbundet - NNV). national authorities by the Ministry of Environment. Comparison of emissions of PVC in juice bottles, vinegar bottles and margarine tubs with resp. PET, glass and laminate. All emissions are in weighted ratio to PVC, which is set to 1. SEM's analyses thus does not provide any grounds for imposing the phasing out of PVC in disposable packing. Parts of the analysis clearly indicate that PVC on the whole is a better alternative environmentally than its possible replacements. The environmental group (NNV) agreed with the main conclusion of the report, but pointed out that ecotoxicologic effects were not taken in account. The NNV made a report on PVC and environmental hazards, mainly on the possible emissions of dioxins from PVC. This is of course one-sided, because the real emissions of dioxins from the alternatives are not at all mentioned and even not measured. See dioxin releases of materials during their life cycle. No need for neutralisation of hydrochloric acid when incinerating at municipal incinerators: NOK 0.65 million/year. Investments in new packaging machines in only three factories: NOK 25 million. Extra costs for the customers, because of more expensive materials, only for three factories: NOK 11 million/year! Why should you pay more for alternatives, which are NOT more environmentally friendly? In Belgium, a heavy ecotax was voted on PVC bottles, to price them out of the market. In the mean time, an investigation In Flanders, the North of Belgium was started by the local government, as a result of a years long discussion between environmentalists and producers about the environmental impact of PVC. Environmental groups (BBL - Bond Beter Leefmilieu - Allience for a better environment), industry and government settled the rules and the products to investigate. The investigation on PVC and alternatives bottles for mineral water was done by VITO, the governmental research institute. Comparison of emissions of PVC and PET one-way bottles with glass return bottles for mineral water. PVC and PET one-way bottles with glass return bottles for mineral water. A lot of other scenario's, like more recycling were investigated too, these are even more in favour of the plastic one-way bottles. Based on this investigation, the proposed ecotax on PVC bottles in Belgium was lifted. In the Netherlands, the most recent study is from Gastec, a consulting firm for the gas industry. They are in no way involved in the chlorine/PVC discussion. They ordered the study to know the environmental impact of different materials in use for gas distribution systems (PE, cast iron, PVC) and one future material (PE-X). They were very surpised themselves of the results. All figures in world-normalised scores (year.10^-10). All alternatives for PVC, do give pollution during production, transport, recycling and/or incineration. In many cases, they use more energy and more scarce raw materials than PVC and in many cases they give more important air and water emissions than the production, transport, use, recycling, incineration and accidental fires of PVC. There is no reason to treat the environmental impact from PVC in its whole lifecycle different than for the alternatives. And there are no reasons at all to ask for a ban on PVC, only some minor for a change-over to alternatives. But there are at least as much reasons for a change-over from the alternatives to PVC.